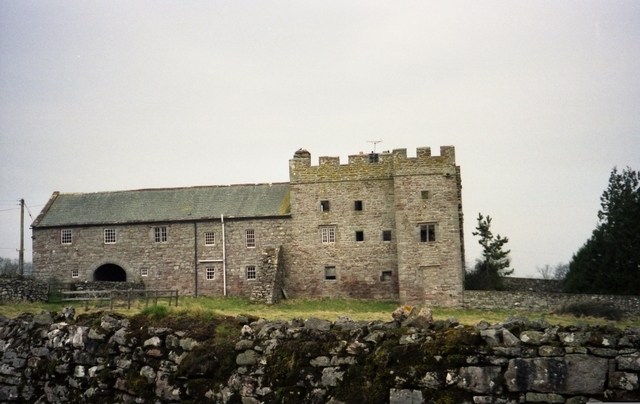 Notes: Burneside Hall is a converted medieval pele tower in Burneside, Cumbria, England. Documentary records for Burneside Hall extend to 1290, when a property was owned on the site by Gilbert Burneshead, the Under-Sheriff of Westmorland. Richard Bellingham, a member of an influential Northumberland family, married Burneshead's daughter, acquiring the site. Burneside Hall in its current form was originally built in the second half of the 14th century by the Bellingham family.The medieval heart of Burneside Hall was a pair of pele towers, linked by a large, open hall. Only one of these towers still remains, three storeys tall but badly ruined, measuring 20 feet by 35 feet (6 metres by 11 metres). This tower was originally the buttery and pantry, forming the service end of the castle. The second tower was of similar height to the first, but narrower; it was rebuilt in the 18th century and effectively destroyed.